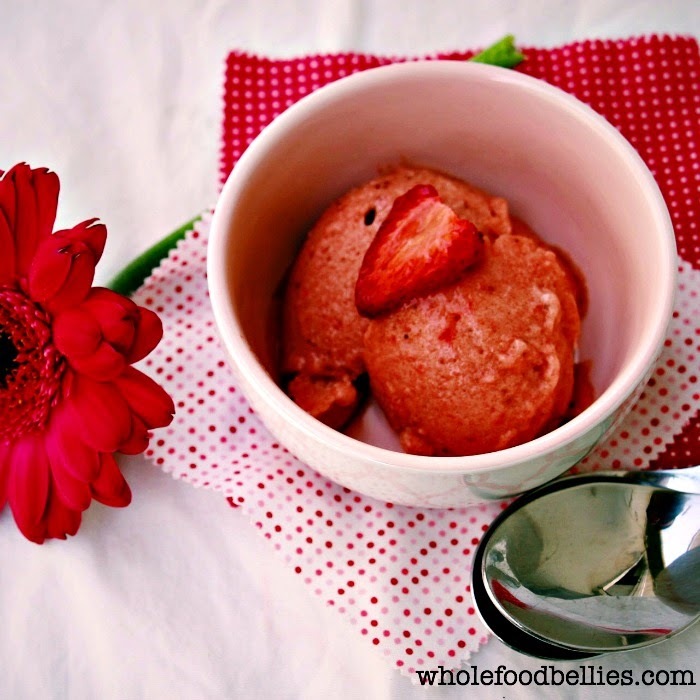 Today Donna from Whole Food Bellies is going to share a recipe for Banana Berry Nice Cream. It is so simple to make and it tastes delicious! Hi I am Donna. Mom of two adorable little food monsters and wife to one big monster. For the last few years I have taken my little family on a whole food journey; and I blog about it. I share family friendly clean eating recipes, tips and tidbits about our experience along the way. For me, as I am sure it is for a lot of people, summer brings flashes of splash pools and ice cream. There is nothing better than sitting in the backyard, as the evening starts to cool off, and enjoying some ice cream with the family. 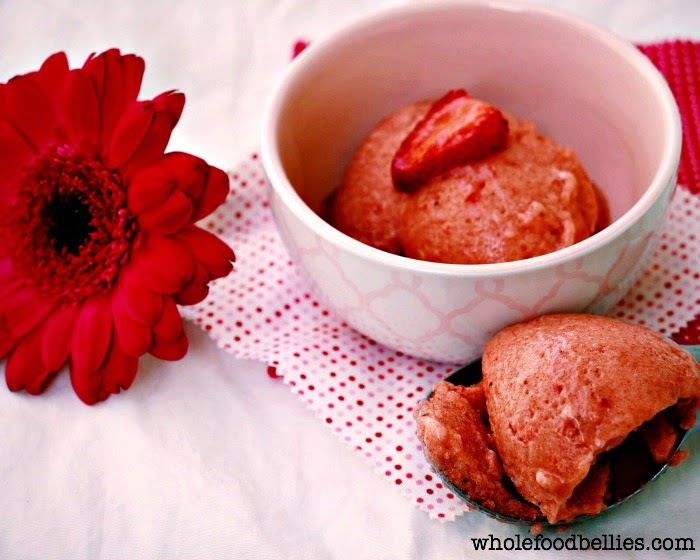 Homemade ice cream just makes it so much more special. With only 2 ingredients, it could not be simpler! 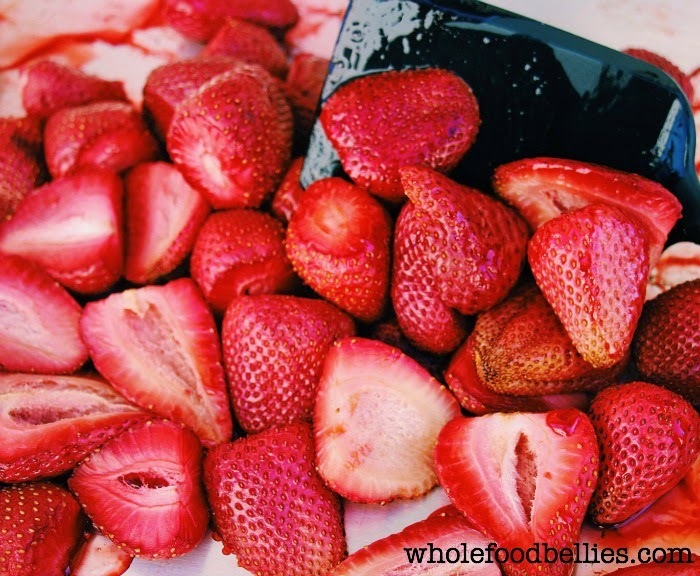 I used Roasted Strawberries for this batch because it just adds an extra depth of sweetness which I love, but if you are pushed for time you could definitely throw some fresh/frozen strawberries in there and it would still be delicious! Bonus: it’s healthy so you can totally justify having ice cream for breakfast. Just throw some granola, nuts and/or coconut flakes on there and call it a day. I won’t judge...mainly because I can guarantee I will be doing the very same thing! Tip: Make sure you always have frozen bananas on hand during summer. I buy the over-ripe ones they are selling off cheap at the markets and freeze them straight away. You never know when the need for banana ice cream will hit and they are also a great addition to smoothies. What’s your favourite thing about summer? Do you love ice cream as much as we do? Take 5 ripe bananas, peel them, cut them in half and add to a plastic freezer bag. Freeze overnight until solid. 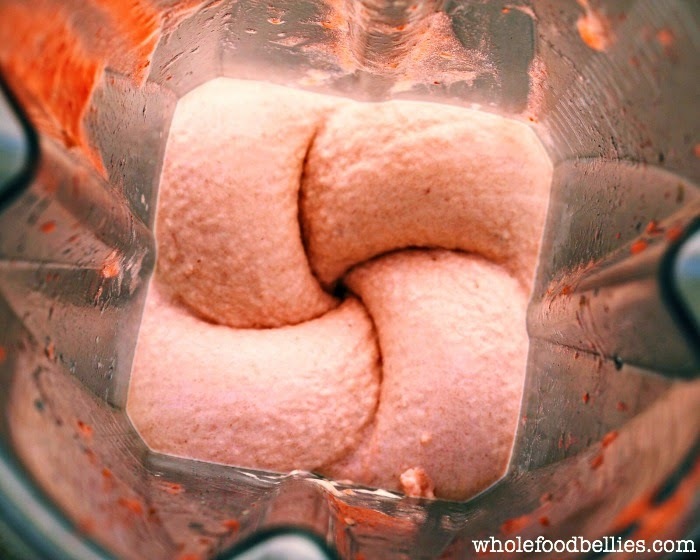 Cut the frozen bananas into half inch chunks and throw them into a food processor. Process for 30-45 seconds until smooth and creamy. Throw in the strawberries and pulse for a few seconds until combined to your liking. It is super creamy if served straight away but can be frozen - it just won’t be as creamy. Thanks so much for your post, Donna. I know my children cannot get enough of this recipe and I know my readers won't be able to either!